The book starts with the famous words of Julius Caesar "Veni, Vidi, Vici" - I came, I saw, I conquered. And then he says that we should remember this each time we go to a casino. 1. If you have no idea about the slots, but you play them anyway, you will lose. 2. If you learn "what, where, why, how and when" in slots, you can win. Now you see the difference, you actually have the opportunity to hit jackpot. Victor Royer is convinced that a true winner is the one, who is skilled, professional and ready to win person. Nothing can be omitted from the list. That is why he explains some technical aspects of the slots, like what that is and what is the purpose of that. He also likes to emphasize on the important parts with the help of Italic print. Honestly, you really pay more attention to those words. Royer covers the matter of the progressive slots, which can or cannot be the carousel. He thoroughly explains them and the principles of their work. What else is interesting is that the author tells about different aspects of the slots not only in the modern view but also the way it was throughout history. If he tells something about the denominations, he would mention the way it was years before. Also there are historical aspects in the Slot Machines: America's Favorite Gaming Device by Marshall Fey. The other wonderful thing about the book is that the author included several Las Vegas stories about the slots. And he devoted a part of the book to the Questions and Answers section, where the answers for the frequently asked questions are given. Also he suggests a smart strategy to winning the slots game. He builds it around the bankroll. It is a top secret for many gamers who do not even think that slots are the game of chance. 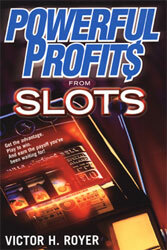 Powerful Profits is a part of the books series devoted to the games like blackjack, craps, video poker, and keno and so on. Frank Legato also covers some slot winning aspects.